About two years ago China's health minister Li Bin had a problem. The masses were not happy with her privatisation reforms of China's healthcare system. Prices of medical treatment were going up, service levels were way down and there was a widespread and justified suspicion among the public that they were being ripped off by a corrupt and dysfunctional health system centred around the state-owned monopoly of for profit 'public' hospitals. It was hard to see a doctor, expensive to see a doctor and the treatment was brief, perfunctory and often inappropriate. Patients were being prescribed expensive drugs they didn't need, just so the doctor and the hospital could generate more income. Unable to vent their frustration on the Party, the public started attacking healthcare staff. Doctors and nurses were abused for being on the take, and sometimes assaulted - even stabbed and killed. Hospitals were disrupted by family members unhappy with their treatment - doctors were blamed - sometime even held hostage. There was a widespread feeling that doctors were useless, arrogant and often on the take in he form of commissions and hongbao (red envelopes). So what did health minister Li Bin do? As usual in China, "moulding public opinion" (propaganda) was one of the standard methods for managing the masses. Li Bin turned to propaganda chief Liu Qibao (刘奇葆) head of the Party's 'publicity' department. His solution to restore confidence in China's healthcare system was a campaign to portray doctors as heroic, selfless martyrs, serving the people. The order was passed down through regional propaganda channels for media outlets at provincial, city and township levels to feature prominent stories of heroic doctors. "Capture the Lei Feng spirit of the heroes and angels in white coats" was the decree. 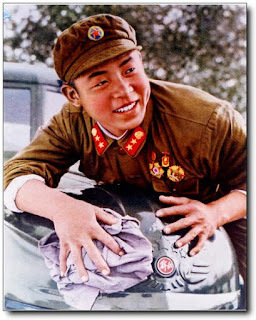 Each TV & radio station, newspaper and magazine was given a quota of at least one 'Lei Feng doctor' story every quarter. Unable to find many real-life saintly doctors, editors and reporters racked their brains to come up with ideas. One of them in Yunnan came up with the idea of a selfless doctor turning up for work even when they were sick. In China sickness and tiredness are taken very seriously, with constant exhortations from family and friends to rest, take it easy and eat some medicine/wrap up warm when sick. So the image of a doctor ignoring all this folksy advice and going to work was a very powerful one. To ram home the message, the doctor was portrayed as being rigged up with an intravenous infusion via a cannula in the arm. Again in image-conscious China this is the bog standard visual standard that says "I am sick". The article about the selfless and noble doctor working despite being sick was very successful and generated a lot of sympathy via social media. And as with most successful ventures in China, it quickly spawned imitators. 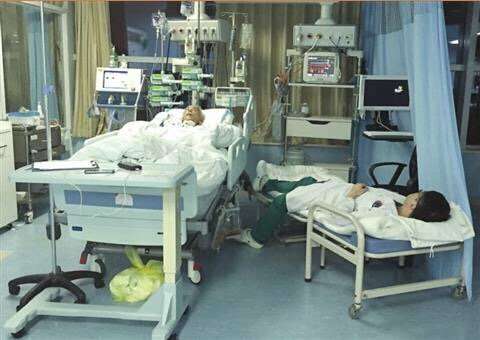 Other media outlets began to run their own copycat versions of the "Sick Doctor Still Working" story and they have become a regular weekly feature of the Chinese media since since 2014. And in a case of life imitates art, it has now become fashionable for medical staff to do self portraits of themselves working while sick. And so to celebrate this ongoing selfless doctor I'm-Sick-But-Still-Turning-Up-For-Work schtick (Dai Bing Shang Ban in Chinese), China Medical News present this year's inaugural China's Top 10 Lei Feng Medics awards. Our first entrant is a Dr Feng, 42, a neurologist from Shaanxi. He was photographed working with a drip stuck in his arm. His patients were reported as saying he had a wonderful, dedicated attitude to his work and would not go home despite having a nasty cough. Get well soon Dr Feng! (but you lose marks because a drip is now so unoriginal). 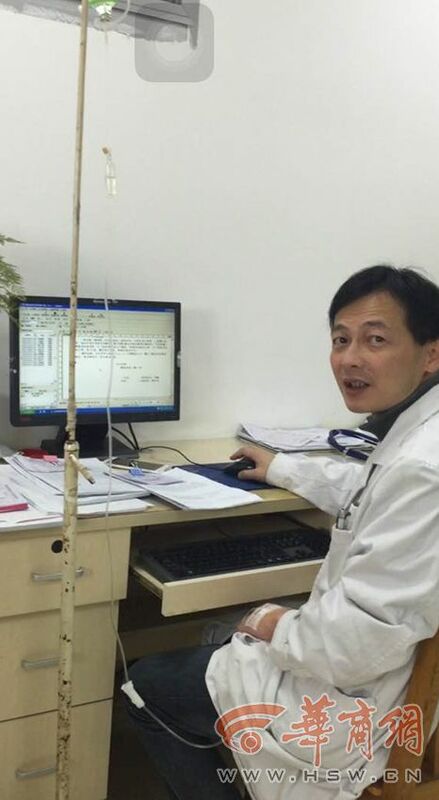 Not to be outdone by provincial upstarts, Beijing's propaganda team felt that just having one doctor with an infusion at work was not enough. The capital had to do better so they found a pair of female doctors on duty - one with 'phlebitis' requiring IV antibiotics, while the other had asthma that required constant use of a nebuliser. Never mind that anyone needing that much inhaled drug likely has very poorly controlled asthma, setting a poor example of asthma management. Tut tut. Amateurs. Not sick, exactly. but dead on his feet. This unknown cardiac surgeon assistant was photographed by a journalist while napping next to a patient. in the ICU. According to the blurb the young doc was so exhausted after doing several hours of surgery that he had to catch up with some sleep while on the job. In some countries this would be condemned as working unsafe excessive hours. In China it is lauded as being a noble example of overwork. Infections and fatigue are for wimps. Real doctors go to work with broken bones. Just ask Dr Wu, an orthopaedic surgeon, from the beautiful city of Guilin. 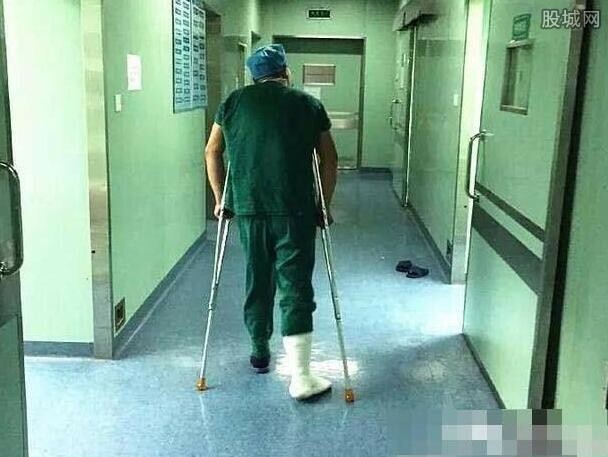 He was pictured hobbling round the Guilin Medical University Hospital on crutches, having allegedly fractured his ankle in a motorbike accident. The patients thought his presence at the hospital was a reassuring sign of devotion. We think it is a sign of stupidity - especially from an orthopod, showing a bad example to his patients. 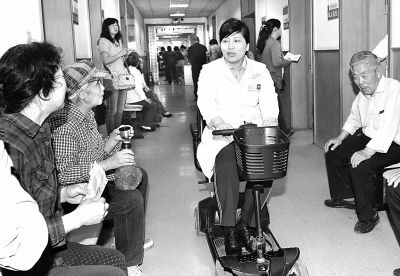 Never mind crutches, Dr Li of Jiangsu showed that the smart doctor with mobility problems gets some wheels. 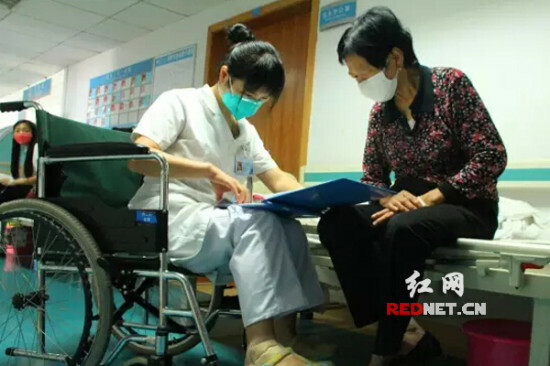 She turned up for work, allegedly, at the stomatology department of the Xuzhou No 1 Hospital. Bonus points for the mask Dr Li - you don't want to get sick from patients, it might mean you have to take time off work! When it comes to mobility, the military always do things better. 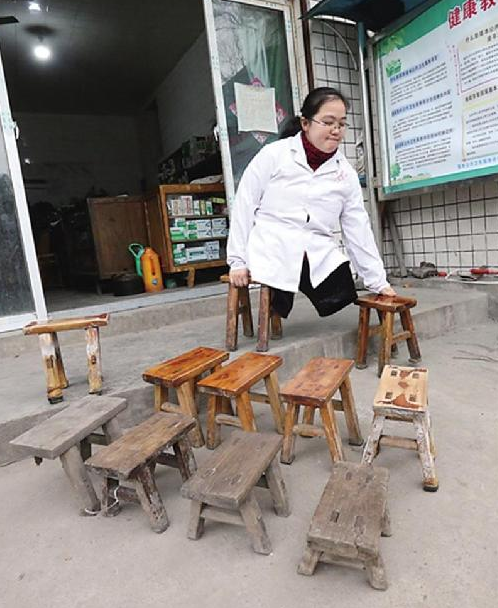 When her injured leg meant she could not walk to work, Dr Zhao Hongyan of the Armed Police Force Logistics College Affiliated Hospital in Tianjin spurned a wheelchair in favour of the electric variety. Working while sick and also promoting the Four Modernisations!Top marks for efficiency Dr Zhao, but a fail for your blinged up wheelchair lacking the pity factor for eliciting sympathy from the masses. This one isn't a doctor, but the so called "Angel of the Hospital" was celebrated in the media for her selfless attitude to healthcare work when she worked despite having a slipped spinal disc. 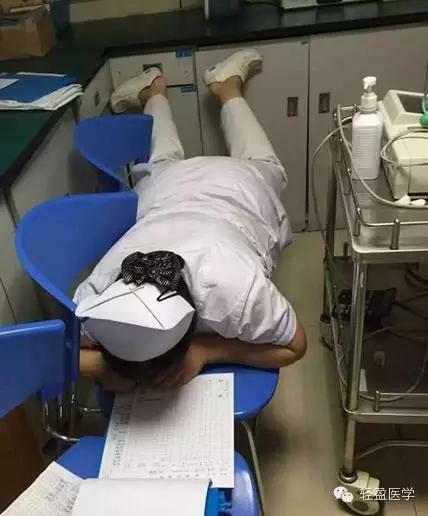 Allegedly in severe pain, Nurse Chen nevertheless was determined to persevere with the paperwork, so she lay down on some chairs. Thanks for taking the strain of your colleagues - as well as your back - Hero Nurse Chen. 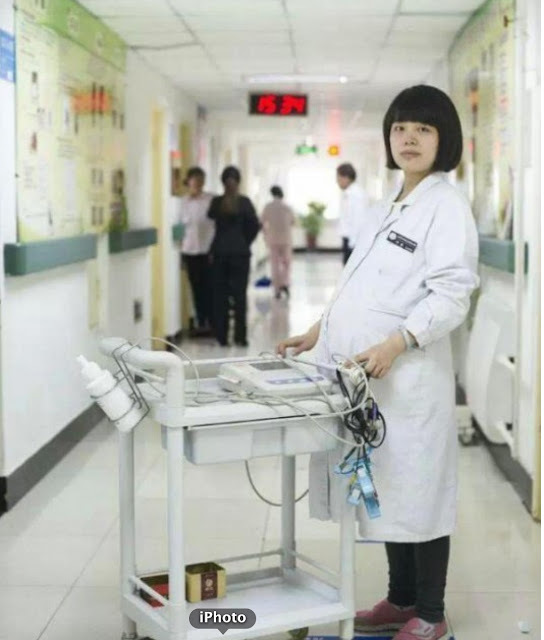 OK pregnancy is not a sickness, but ultrasonographer Dr Zhang Hong of Wuhan is portrayed as the 'Beautiful Doctor and Beautiful Mother' in the local media for working right up until the term of her pregnancy. 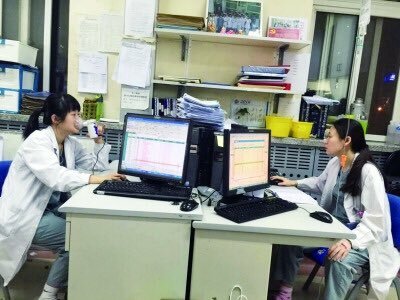 Dr Zhang said she felt tired and dizzy but did not want to let down her colleagues or her patients. Not sure if this is genuine or posed. Most of our nominees so far have had temporary sickness that should have prevented them from working. 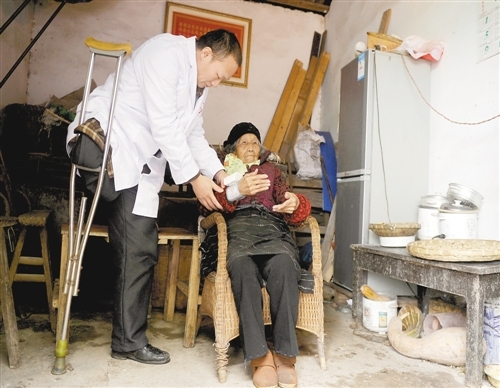 Dr Li Zhengyong of Jiulong, Sichuan has a permanent disability from losing a leg after being hit by a truck decade ago. Despite having only one leg the 35 year old dedicates himself to working in the village. It may be propaganda but you've got to admire him. And the winner is .... drumroll ... the ultimate prize for working while sick must go to this noble lady doctor of Hechuan village near Chongqing. An amputee since the age of four, Dr Li worked her way though rural medical collage to become a township medic serving about 1000 patients. Yes, it's a propaganda piece, but Dr Li deserves all the kudos - and the Golden Lei Feng Award - for her super service. Now, who's got the nerve to be nasty to doctors? * If you're sick enough to need an IV drip in your arm, perhaps you are not well enough to perform your medical duties to a safe level. You are putting patients at risk. * If you have an infection that requires antibiotics, it must be serious. Why are you putting at risk vulnerable patients and colleagues through transmitting this infection in the hospital environment? * IV antibiotics are not appropriate for routine infections. It's bad medicine. What kind of example are you setting to your patients (and to junior colleagues)? * Would you advise your patients to continue working while seriously ill? No, because it delays recovery. So don't lead by bad example. * Doctor's health is important. Doctors need to be healthy. By showing up for work while sick you are normalising and encouraging unhealthy behaviour. You may be putting pressure on other staff to do the same. * Patients aren't stupid. They know that seriously ill people should not be working. By making an ostentatious show of working while sick, you are eroding trust in the medical profession and the judgement of doctors.